It was Gordon Sharp’s experiences as a six-year-old boy in the Glasgow Blitz that first set him on the path towards a medical career. 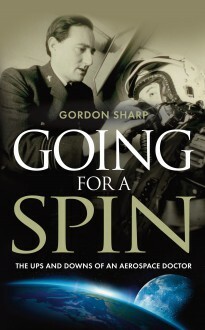 By the time Gordon had left school he had two firm goals: to specialise in aviation medicine, and to try his hand at broadcasting. He managed both in style, becoming Commanding Officer of the RAF’s Aviation Medicine Training Centre and later Head of Division at the Institute of Aviation Medicine. During his time in the RAF Medical Branch he carried out pioneering work in the development of safer systems for aircrew. As a member of the ITN studio team during the Apollo space programme in the 1970s, Gordon became a familiar face to TV audiences. Then, just when he thought life held no more surprises, he found himself flying high in a different sense when he was invited to serve as ‘Physician Extraordinary’ to Her Majesty The Queen Mother. Going for a spin is Gordon’s fascinating and entertaining story.